By using a high-tech rotary instrument rather than traditional hand tools, Dr. Alexanians can quickly and efficiently clean an infected root canal. Rotary hand instruments are also smooth and quiet. They don’t emit the discomforting loud, grinding sounds that hand tools often do. 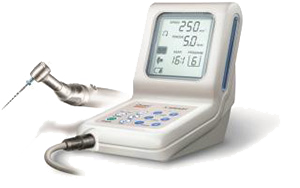 This electric hand tool, combined with Dr. Alexanians’ gentle approach, training and experience, makes root canal treatment a much more comfortable experience for our patients. A root canal is a pulp-filled cavity – or two cavities – in the root of a tooth. Root canal treatment is performed to save a tooth when decay has destroyed, or is likely to damage the tooth root. Prompt treatment helps prevent the spread of infection to other teeth and provides relief from pain. Dr. Alexanians will gently remove the infected pulp, clean and disinfect the root chamber, and insert a composite resin to replace the pulp. 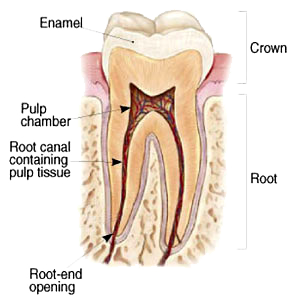 A tooth is often capped with a crown after a root canal to provide additional protection. Saving your natural tooth is important to maintaining your ability to chew and bite normally, to keep adjacent teeth from shifting and to provide stimulation for bone growth. Dr. Alexanians uses high-tech rotary tools to perform a gentle and thorough cleaning of a root canal. The tip of this electric hand tool is equipped with nickel titanium, a material that is five times more flexible than the stainless steel used in manual tools. This means that Dr. Alexanians can reach deeply into the root canal to perform a very gentle and thorough cleaning without stretching or damaging the passageway. This approach makes treatment both quick and reliable. If you are anxious about dental treatment, Dr. Alexanians offers several types of sedation to ensure that you are comfortable and relaxed throughout the procedure. Dr. Alexanians is a leader in providing IV sedation, and also offers oral sedation and nitrous oxide if needed.